Rejected from Haas? Dance! Failed to meet that nifty 3.5 major cap? Dance! Rejected from all 18 of the summer internships you applied to? Dance! Mugged on Ellsworth? Dance! We know, starting with the obvious choice, but hear me out: this is the perfect place to bust a move for our more prudent Bears. 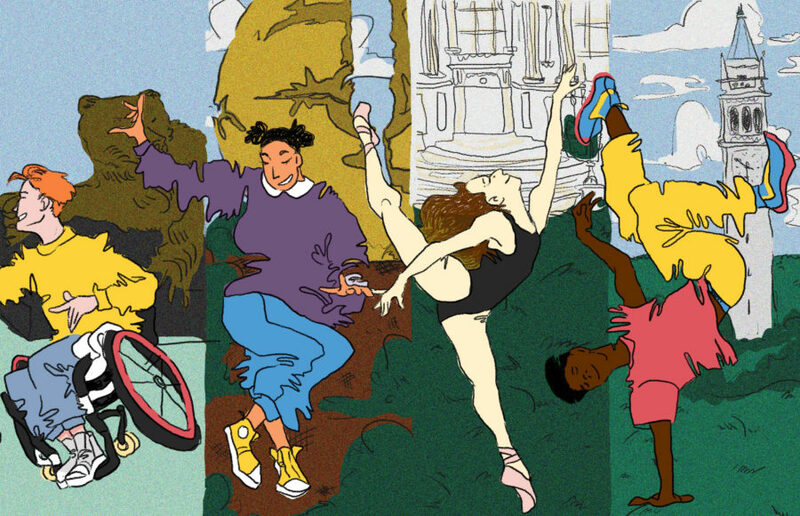 Lower Sproul is prime real estate to discreetly dance because you’ll easily blend in with the student org that calls this square home: AFX. Simply don your newest pair of Adidas sweatpants (three stripes minimum), pull on a red flannel and place a faded pink (preferably Stussy) hat on top of your luscious locks and you’re good to go. No one will notice you popping and locking to Pitbull’s “Time Of Our Lives” because everyone will be doing the same. We’re honestly surprised more parties don’t happen on the Glade — it’s surprisingly well lit and the soft, dewy grass gives you a chance for some of the more creative dance moves. As an added bonus, Bear Transit can take you home whenever the hangover from the adventures earlier in the night start to creep in. Zumba is your one and only chance to become the best J. Lo you can be. Plus, it burns a lot of calories, we think. Become that fine piece of modern art you know you are! Onlookers will probably be analyzing whether or not your best rendition of “the sprinkler” is allegorical to the infiniteness of time or something, but hey, fans are fans. Seriously, this table is the definition of resilience. We’ve have seen countless sorority women jumping up and down to their favorite Chainsmokers song and the big boy didn’t even complain. There’s usually so much PBR spilled on its surface that you can even use it as a Slip ‘N Slide on those hot summer days. Expert craftsmanship. The “loud” signs are there for a reason? Plug in your earphones, scroll to your favorite pop icon, pick up your Mac and sashay your way through Moffitt, onto the couches and off, maybe making a trip into those special coed bathrooms. No one can stop you, right? Studying has never been so healthy. On the corner of Hearst Avenue and Gayley Road lies a little-known Berkeley monument: Founders’ Rock. As legend tells, our original founders stood upon this rock and quoted Bishop Berkeley’s verse “Westward the course of empire takes its way.” That’s basically rap! But also hecka colonialist, so we think it’s time we danced all over our imperialist legacy. Get your groove on Bears!